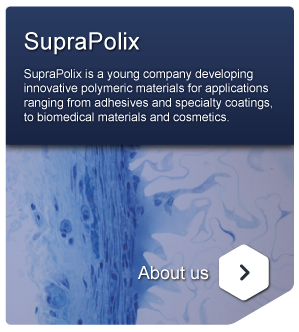 Dynamic elastomeric SupraB-materials with self-healing benefits: freshly cut surfaces display adhesive strength resulting in instantaneously self-bonding. Rejuvenation of damaged coatings using the SupraB-technology: high flow at high temperatured restores damaged coatings within seconds. Elastic hydrogels: just water held together by the strong SupraB hydrogen bonds, not only strong but also thermo-reversible. 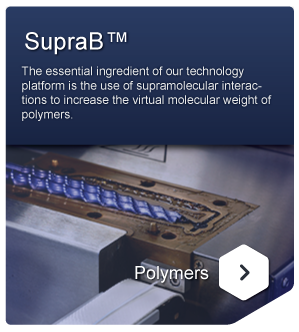 SupraB™ delivers unprecedented self-healing behavior in a wide range of polymeric materials. applications benefit from our proprietary SupraB™ quadruple hydrogen bonding technology combining material performance with unique processing conditions. 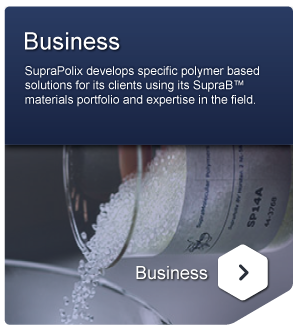 portfolio, and on its expertise in transferring the SupraB-technology to working solutions. exploitation of all the material properties of existing plastics is possible, deepening their use in many large-scale applications that will benefit from ease of processing, advanced dynamical behavior or self-healing properties.